Today's new product is all about Valentine's Day! This is an editable PowerPoint trivia game that's great for class parties for older students. 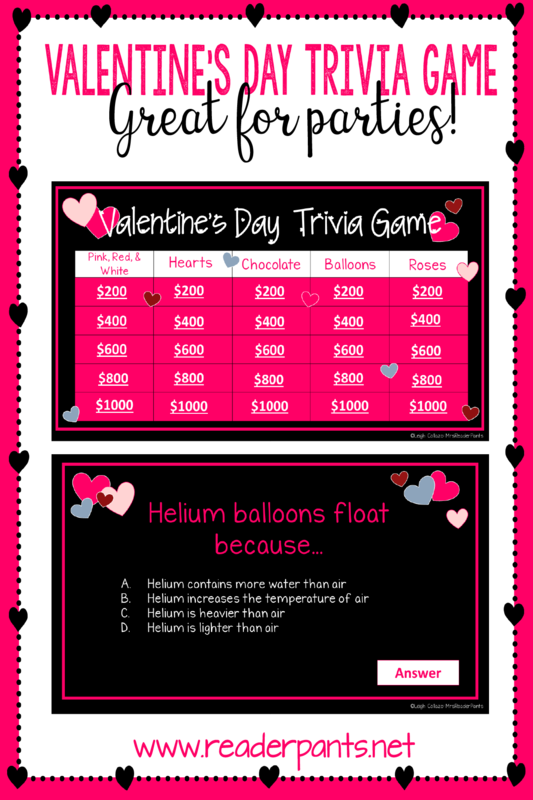 It includes 25 questions in five categories: Pink, Red, & White; Hearts; Chocolate; Balloons; and Roses. 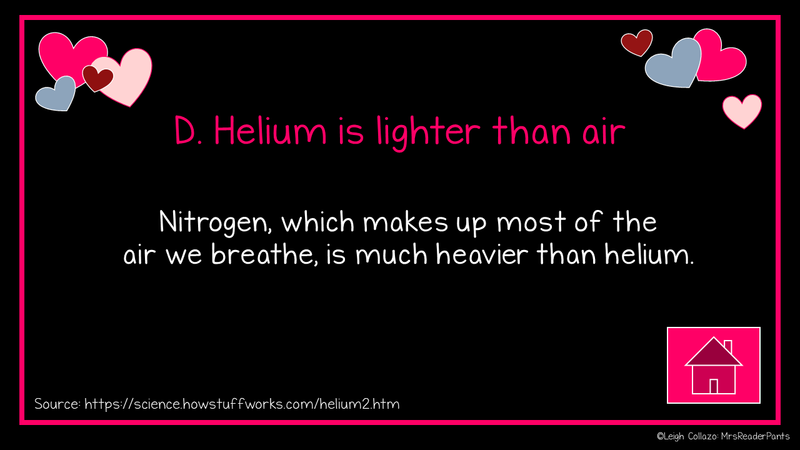 Trivia questions cover science, literature, and social studies topics. All questions are multiple-choice, and all include the answer and a short fact about the topic (see sample slides below). 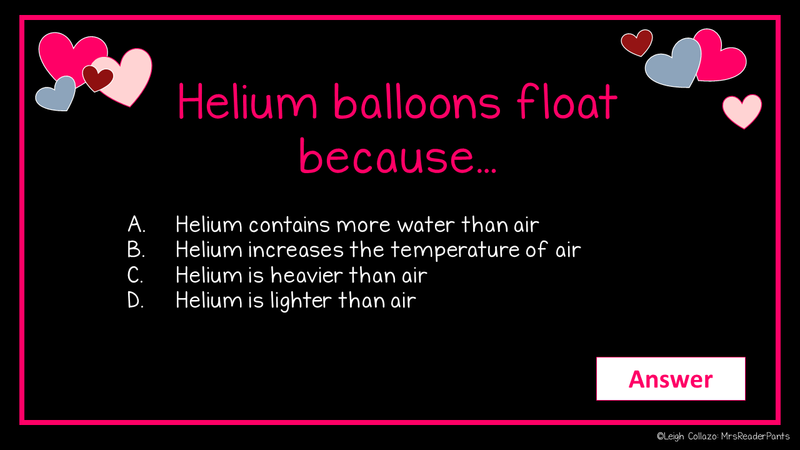 Printable questions and answer keys are also included in the set, and all text is editable in PowerPoint. from the game board for the rest of the game. When I taught seventh grade English, I liked to do informal class holiday parties with my students. At the middle school level, many schools do not do Valentine's Day parties school-wide, but some teachers (like me!) do them anyway. Middle school students love having fun, too, and any holiday that celebrates love, friendship, and chocolate is one I want my students participating in, even if the celebrations aren't school-wide. Since I did these parties informally, I did not send any letters home or involve parents in the party planning. I simply told my students they could bring snacks that day to eat in class. Students could choose to bring their own snacks, or they could bring a snack to share with everyone. Most classes have at least one student who is into baking and wants to bring treats for everyone. I also always made cupcakes or cookies for everyone, so every student at least got a junkfood treat from me. For Valentine's Day parties with slightly older students, it can be a challenging to find Valentine-themed games and activities that are aimed at middle schoolers. I needed a party activity that was both fun and educational and that did not feel too "babyish" for older students. Since Valentine's Day falls between semester exams and the dreaded STAAR writing test, I also wanted to give my students a little break. Middle school students love trivia games, and I often use Kahoot in the library for this reason. I love Kahoot so much that I wrote a post about it a few months ago. But Kahoot gives me two major problems: internet instability and device access. I live in China, where my school's internet mostly works well. But when the internet is wonky, it is really wonky. Kahoot does not play well with slow internet. Sometimes students randomly lose their connection and get kicked out of the game. Slow internet also causes students to be unable to enter their answers until after the question times out. It's frustrating for us all. The other issue with Kahoot is device access. Most--but certainly not all--of my students have their own phones and laptops. But these phones and laptops vary in age, quality, and speed. For every student using their own device to play Kahoot, I have a student who needs a school device to play. In the library, I have a laptop cart, so this isn't a huge issue for me; I have enough laptops for everyone who needs one. But classroom teachers and libraries that do not have laptops won't be able to provide students with the devices they need to play Kahoot. Because of these issues with Kahoot, I've created this Valentine's Day trivia game in PowerPoint. Teachers and librarians can use the game whether or not internet works, and students do not need access to technology to play. All the text in the game is 100% editable, so you can change the questions to anything you like. I've included lots of literature and science questions, along with a few social studies questions. 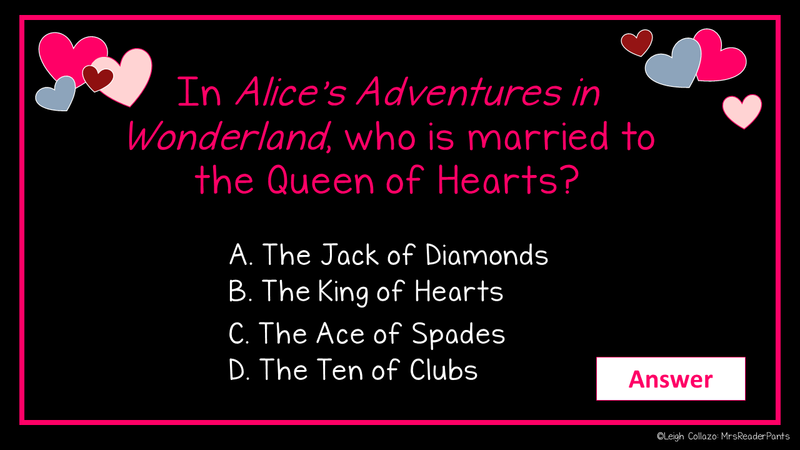 **UPDATE** I have added this section to explain how to use this quiz in the classroom. Let's say you are working with a classroom of 25 students. All of the students will want to play the quiz at the same time. I have two ways I've used PowerPoint quizzes with my students in this scenario. For a class of 25 students, I divide the students into five teams of five. I write the teams on the board: Team 1, Team 2, Team 3, etc. This is where I (or a student volunteer) will record the dollar amounts for each team. Option 1: Teams take turns selecting and answering the questions. 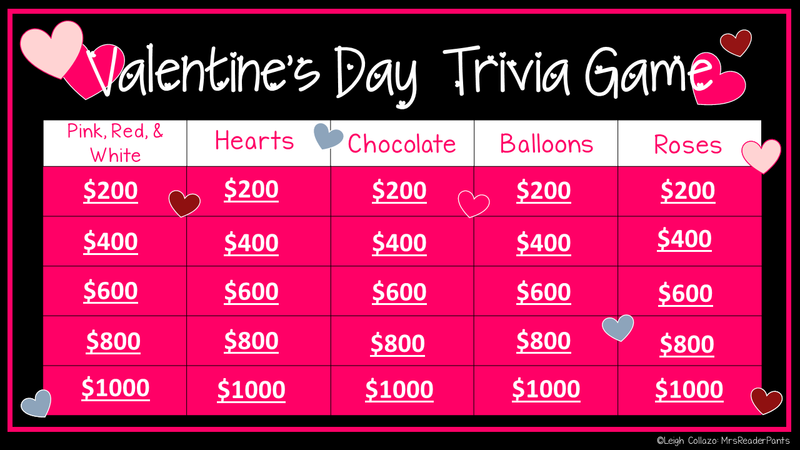 Let's say Team 1 selects the "Hearts for $400" category. The teacher would click the question and read it aloud. The team would work together to decide on an answer. If the team gets the answer correct, they get the dollar amount added to their score. If the team says the incorrect answer, the question goes to the next team. The next team them gets to answer that question (either correctly or incorrectly), and they also get to choose their own question. This means one team could possibly earn points for two questions in one round. Option 2: If you have small whiteboards in your classroom, the teams could answer the questions at the same time. Give each team one whiteboard. The teams take turns selecting question categories. When a question is read, all the teams write their answer--A, B, C, or D--on the whiteboard for their team. All the teams getting the answer correct get the points. Always offer prizes! Students love prizes, and they make the game so much more fun! I like to offer prizes to everyone for playing but give the winning team a slightly larger prize. For example, for this game, I would do a Valentine's Day-related prize. The small prize might be a fun-size Valentine's Day treat, and the winning team's prize might be a larger-sized treat. If you want to stay away from food-prizes, you could offer Valentine's Day pencils, small notebooks, no-shoes days, or homework passes. Check Oriental Trading for loads of inexpensive Valentine's Day prizes. 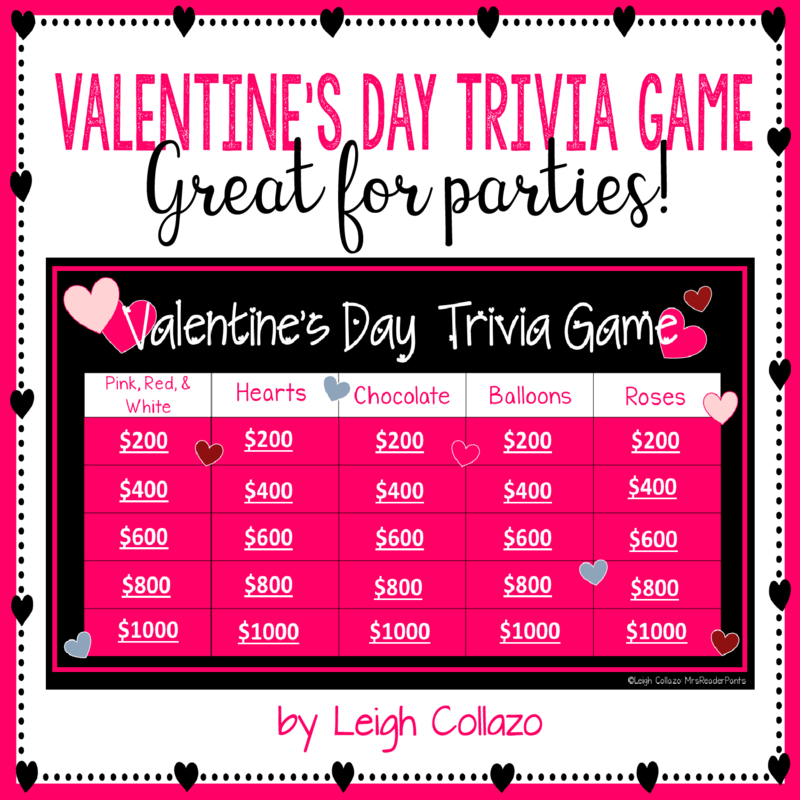 I purchased your Valentine's Trivia game and am looking forward to using it. Can you give me an idea of how you run the game for a group of students? I'm trying to figure out the logistics. Do you have, say, 20 students playing separately? Taking turns choosing a category and value amount? Do they keep track of the "money" they've earned? I usually do teams. If I have 20 students playing, I divide them into 4 or 5 teams and keep track of the money on the board.